Solidarity's routing/transit number is 274974726. 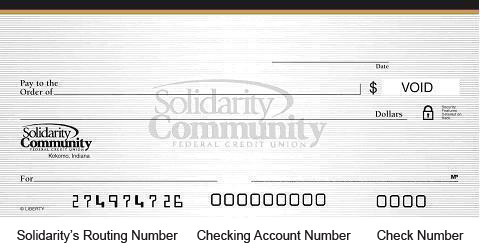 This can be used to set up direct deposit, automatic monthly withdrawals and/or credits to your Solidarity accounts. You'll also need your account number, your social security number and your phone number. See the format you will need to use below. Direct Deposit gives you more time to do the things you really want to do. No standing in line to cash your paycheck, Social Security check or other government checks. It's done automatically every month. All you need to get yourself signed up for Direct Deposit is the following information.